There’s a statue in Nottingham, England of Robin Hood. He and his Merry Men are known for robbing the rich to give to the poor. 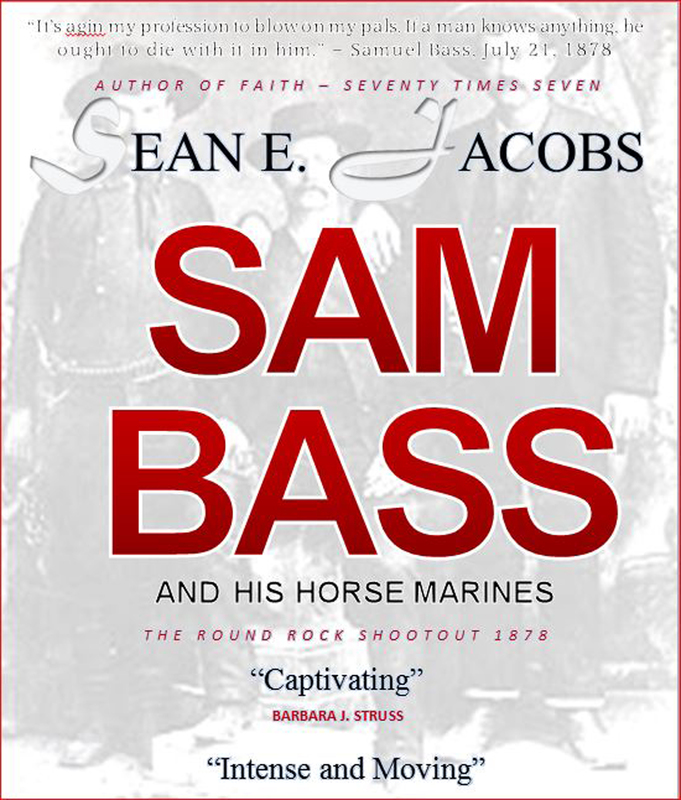 Five centuries later there’s Sam Bass, later known as the most notorious outlaw in the state of Texas, along with his desperados, not known as Merry Men, but as the Robin Hood of Texas and His Horse Marines. Sean E. Jacob’s creative nonfiction style of storytelling is exemplified when he retells the true story of Sam Bass and Gang. The first real question that comes to mind, was Sam Bass the Robin Hood of Texas? One would sure think so. Why would such a notorious outlaw have a Texas Historical Marker, a carefully maintained gravesite, and reenactments of his final shootout in Round Rock, Texas each year? Sam Bass Road has been around for years, but the deputy sheriff he allegedly killed, remained lost in the history books until many years afterwards. As a matter of fact, it was only in recent years the deputy, Caige Grimes, also known as Alijah W. Grimes, was memorialized by a road being named after him in Round Rock, A. W. Grimes Blvd. Sam Bass was a reckless young lad who remained true to his men to the very last, who shared his gold with the less fortunate in Denton County, Texas. He was gallant with the ladies in each town he traveled and dearly loved children and horses. Captain Bass was a charismatic leader who won the respect of cowboys, ranchers, saloon keepers, and farmers all across north Texas. But still, we must ask the question again, was Sam Bass a Robin Hood? Were his fellow desperados the Merry Men of Texas? As the first in the Texas Outlaw series, the life and adventures of Sam Bass, the notorious Union Pacific and Texas train robber, unfold. James B. Gillett, six years with the Texas Rangers, and many other law enforcement individuals chased Sam Bass and his outlaws across Texas in one of the longest, if not the longest, manhunt in history. This fresh retelling of Sam Bass deserves a place on the bookshelves of Texas history. There are many historical figures from the Lone Star State in this portrayal of Bass and gang. Governor Hubbard, after listening to the outcry of the legislature, called in the Texas Rangers and other pioneer law enforcement individuals of Texas to seek out and capture Sam Bass. The Rangers, in an effort to coral Sam Bass, find his trail heading west in an attempt to join up with Quanah Parker and the Comanche, the most powerful Indian tribe of the time. In 1938, a race horse by the name of Seabiscuit, made history and was one of the most electrifying and popular attractions in sports history. Only a few people today realize the Denton Mare, owned by Sam Bass and sired by the great Steeldust, won numerous races and topped the headlines of many newspapers in Texas in 1875, more than sixty years earlier. I enjoyed the book on Bass and his gang. I would appreciate a phone call or an email from Mr Jacobs or anyone else that knows the Bass history real well, as I have two questions on Sam Bass, and I also own a real key artifact with Bass provenance. It is a real interesting piece of his history.